Hello everyone. I’m Hemant Kr. Malani from Kolkata. 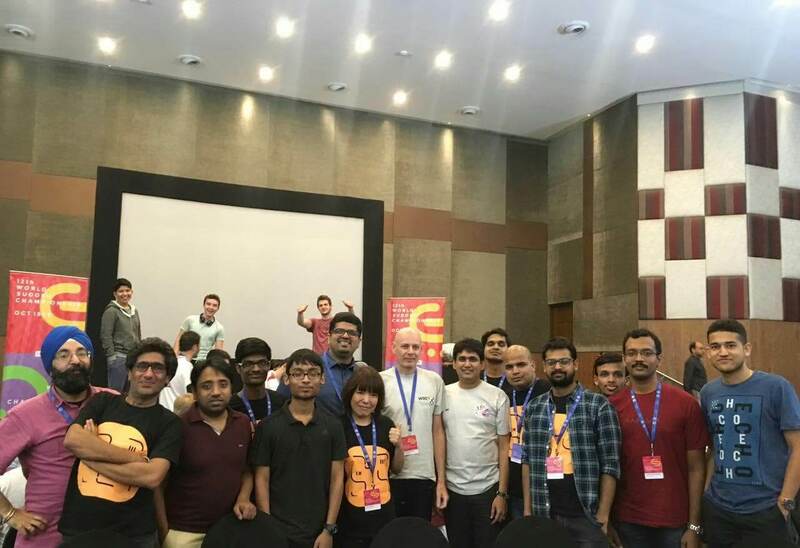 In this post I’ll be sharing my experience at World Sudoku Championship (WSC), 2017 held at Bangalore, which was my first WSC. I started from Kolkata on the morning of 15th October and reached Bangalore at around noon. Ashish and Sai Kartik were waiting for me at the airport and they arranged for my transport along with some other participants from other countries and Jaipal Reddy from India. The event started at 2 pm with a workshop on sudoku solving and creation by Thomas Snyder. It was a great experience to learn from the 3-time world champion. I specially liked the creation part. At the end a fun contest was held in which we had to solve 3 sudokus by Thomas. 5 best solvers from each of experienced and inexperienced category got Thomas’s book “The Art of Sudoku” and I’m very happy that I was one amongst them. Up next was a workshop by Gareth Moore on sudoku creation. I really wanted to attend it but we had not discussed anything about the team rounds. So, we had to leave. After having discussed a bit about the team rounds we all were back for the opening ceremony, registration and Q&A session. With this 15th October came to an end and the competition was to start at 9 am on the morrow. I woke up early and we all reached the competition hall at about 8:30. The first round was the ‘Welcome’ round. It was a combination of 6 classics and 6 variants. I could finish 6 sudokus but later found that I had done a mistake in Coded Sudoku. 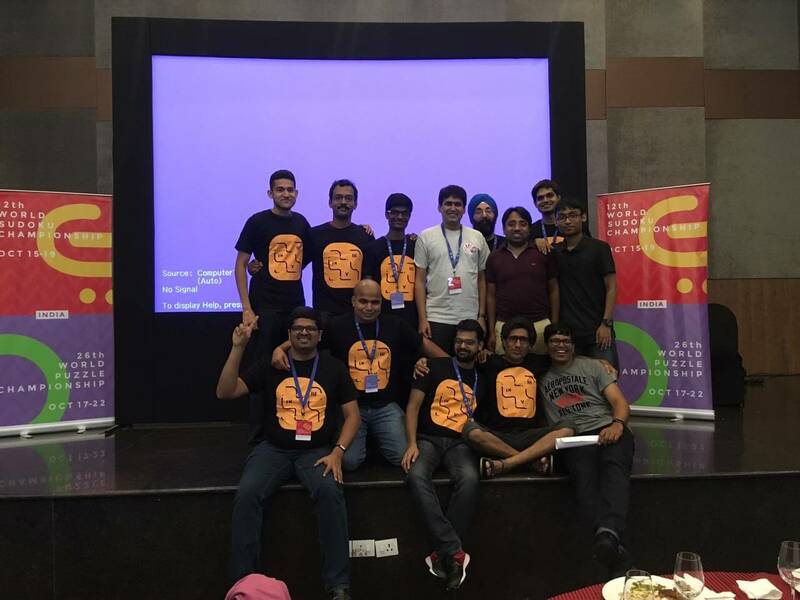 The next round was the one with maximum points with 24 sudokus to be solved in 90 min. I managed to solve 10 sudokus (including all 3 high pointers) but I had swapped some numbers in diagonal sudoku and lost 40 points! The first rounds were going good but the 3rd round was a bad one for me. I broke the arrow-thermo thrice, completed it at the end only to find that I had written 2 4s instead of 6s. I could get only 95 points in this round. Up next was the ‘Where is it?’ round. I hardly had any expectations from this round and just wanted to ensure that I do not get zero. Luckily, I managed to get 40 points. Harmeet and Pranav finished this round with a bonus. With this the session 1 came to an end. We had our lunch and were back to our tables for the 2nd session of the day. The next was the Classic sudoku round. We all had high expectations from this round but each sudoku was a tough solve. I could solve only 4 sudokus. 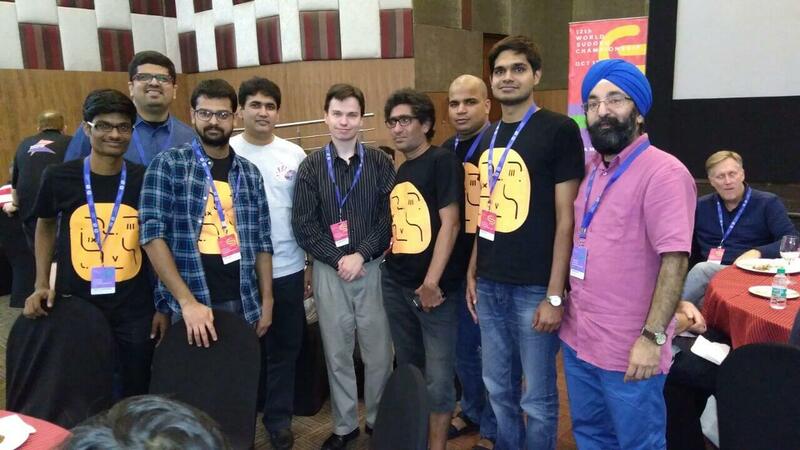 Most of the participants in Team India could solve only 4-5 sudokus. 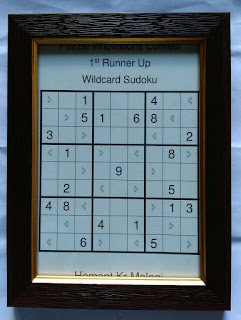 The next was ‘Think Different’ round featuring new variants (including my idea of Wildcard Sudoku). This round went very well for me and I finished 7 out of 11 sudokus. This boosted me up after the bad classic round. But the next round was a puzzle-based round! I could solve only 3 out of 9 sudokus! But the best thing which was happening with me during WSC was that I was never down with a bad round and this helped me a lot. Up next were 3 team rounds. The first one was ‘Yours or Mine’ in which each team was divided into two sub-teams and the sub-teams had to swap the sudokus after 10 min twice. This round went well for us and we expected to get 610 points. But we left a blank cell in Thermo Sudoku and lost 140 points because of that! The next was ‘Dress Them Up’ in which we were given 16 sudokus with 16 separate decorations. We had to match them and then solve. This was a difficult round and we could solve just 2 sudokus getting 205 points. Till now India team B was doing better in team rounds than the team A! The next was the last round of the day—two samurai sudokus in which each one could be any of the two variants. We had to find out and solve. We performed decently in this round too and got 480 points. So, day 1’s competition came to an end but a fun event was remaining. It was a player vs. player knockout event where each player had to compete with one player and whoever wins proceeds to the next round. I got knocked out in the 2nd round itself. But this was a very interesting event and Dai Tantan from China won in this event. And day 1 finally came to an end. The day 2 started at 9 am with a bag of not so common rounds. The first one was ‘All in One’ round. It was a classic round but the 10 sudokus were linked. All 1s in 1st sudoku would appear at the same place in 10th grid, 2s from 2nd grid and so on. I could solve only 3 sudokus. Next was the Instructionless round. I managed to solve 4 out of 9 sudokus, including one high pointer. Up next was ‘The Joker’ round. I was sure that I would do blunders if I started with the high pointers in this round. So, I started from the beginning and completed first 4 sudokus. I was very happy about my performance in these two rounds as I had very low expectations from them. The next was the usual suspects round. I solved 3 high pointers and Trio Sudoku. But unfortunately, I had swapped a 2 and a 4 in Little Killer and lost 70 points! The next on the table was another round with linked classics. I couldn’t complete even a single sudoku but got partial points for complete 3x3 boxes. And it was time for the last individual round—Do Not Blink. I could solve (or rather get the circled digit) in 9 out of 16 sudokus. I really loved this round. With this the individual competition came to an end. There were two more team rounds. First was ‘The Sixers’ round. There were 36 6x6 sudokus using any 6 numbers from 1-9 which had to be determined while solving and then a final base grid had to be solved ensuring that there wasn’t any pencil marks on the final base grid. We had a decent round and were expecting 830 points. But later we found that we had misinterpreted the rule a bit. We thought that only pencil marks can’t be made on final grid but final markings can be. But it wasn’t so and we lost 225 points because of this! Anyway, the last round of WSC 2017 was ‘The Journey’ featuring 25 connected sudokus—12 classics and 13 variants. It was the best puzzle of the entire WSC! A great work by Deb, Prasanna and Rohan! We got 800 points in this round. All the rounds came to an end. I finished at 79th position. India Team B got 22nd position. The best Indian rank was that of Rishi—41st (official rank 34th). India Team A secured 18th rank. But it was not the end! There was something for me in the Prize Distribution. 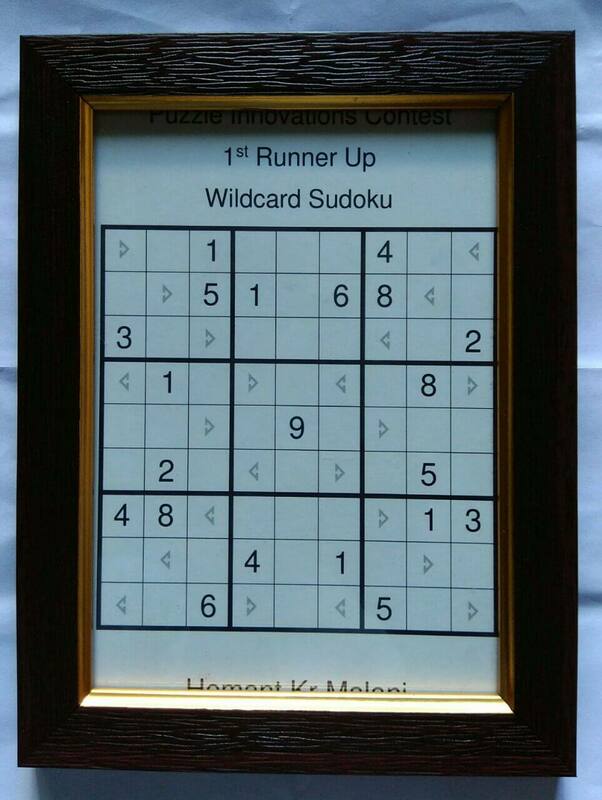 I won the 2nd prize in Puzzle Innovation Contest for the idea of Wildcard Sudoku. 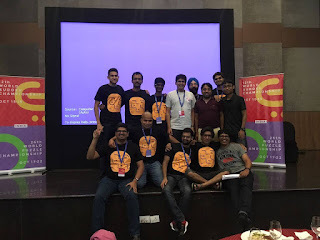 Akash Doulani got the 1st prize for his idea of Odd Even Bridge Sudoku but as he was not there, I collected his prize on his behalf and felt proud! There was one more day at WSC featuring an excursion, a cultural event and GP Playoffs. I was a proctor at the playoffs. I proctored Michael Ley from Germany in the Sudoku GP and Martin Merker, again from Germany in the Puzzle GP. It was a good learning experience for me. My first WSC came to an end. It was a great experience. Thanks to the organisers and the volunteers for putting forward such an amazing event. Looking forward to my participation in more WSCs!